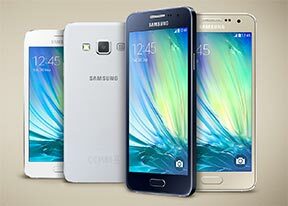 The Samsung Galaxy A3 is utilizing the next-generation of mid-range chipsets with a 64-bit processor - the Snapdragon 410. The new chip offers a snappy quad-core Cortex-A53 CPU running at 1.2GHz. It also sports an Adreno 306 GPU and 1GB of RAM. The single-SIM version of the phone features 1.5GB of RAM. Snapdragon 400 was one of the most popular chipsets for mid-range offerings and it's interesting to see how much faster its successor moves about. Before we begin, it's worth noting that our anti-cheat benchmarks detected no foul play. Onto the benchmarks, then, starting with Geekbench 3, which gauges the CPU performance. The four Cortex-A53 cores at 1.2GHz provide a 25% boost in speed compared to the Cortex-A7 running at the same frequency in the Snapdragon 400. The Galaxy A3 scores similarly to the HTC Desire 510, which too utilizes the Snapdragon 410 chipset, but falls behind the Xperia Z1 Compact and the HTC One Mini 2. AnTuTu 5 is a compound test taking in consideration the on-screen GPU performance and the storage speed as well. The Galaxy A3 beats the Snapdragon 400 competition and again scores similarly to the Desire 510. The cross-platform BaseMark OS II tests even more - it adds the browsing performance to the already lengthy performance equation. Here, the Galaxy A3 aces the test beating the One mini 2 and Sony Xperia M2 Aqua. The GPU intensive BaseMark X came up with a promising score for the Adreno 306. The Galaxy A3 manages to beat the Snapdragon 400-powered One Mini 2. Finally we've checked the Samsung Galaxy A3 web browser performance. The default Samsung browsing app didn't perform as good as the Desire 510 or the Moto G in both Kraken and Browsermark. We'd advise switching to a third-party browser to get better results out of the hardware. Other than the subpar web browsing performance, the Galaxy A3 and the Snapdragon 410 inside it deliver great performance. Tapping around the user interface is fast and seamless. On top of that, the Galaxy A3 is ready for the next-gen 64-bit Android apps and we're sure that once Android 5.0 Lollipop arrives for the phone, the phone will fly thanks to the new ART runtime.